Tropical Storm Florence appeared weaker in infrared imagery from NASA's Aqua satellite, with warmer cloud top temperatures. However, forecasters believe this is a temporary setback. NOAA's National Hurricane Center cautioned that the U.S. coasts will start to feel some effects from Florence over the weekend of Sept. 8 and 9. Regardless of Florence's eventual track, large swells will begin to affect Bermuda later today and portions of the U.S. East Coast this weekend, resulting in life-threatening surf and rip currents. Infrared satellite data at 1:20 a.m. EDT (0520 UTC) on Sept. 7, from the Moderate Resolution Imaging Spectroradiometer or MODIS instrument aboard NASA's Aqua satellite showed coldest cloud top temperatures near minus 63 degrees Fahrenheit (minus 53 degrees Celsius) around Florence's center and in a band of thunderstorms northeast of center. NHC forecaster Zelinsky said "Florence's structure continues to be negatively affected by strong southwesterly [wind] shear. 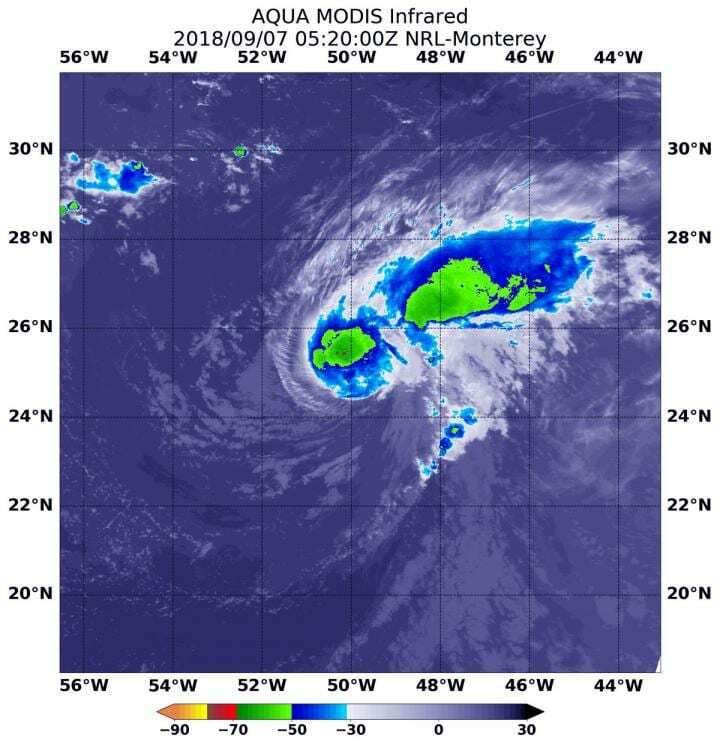 Cloud tops have generally warmed over the past 6 hours, and recent microwave data show that the low-level circulation center of Florence is displaced nearly 20 nautical miles to the southwest of the mid-level center." NHC noted "There is still very large uncertainty in Florence's track beyond day 5, and it is too soon to determine what, if any, other impacts Florence could have on the U.S. East Coast next week. ".